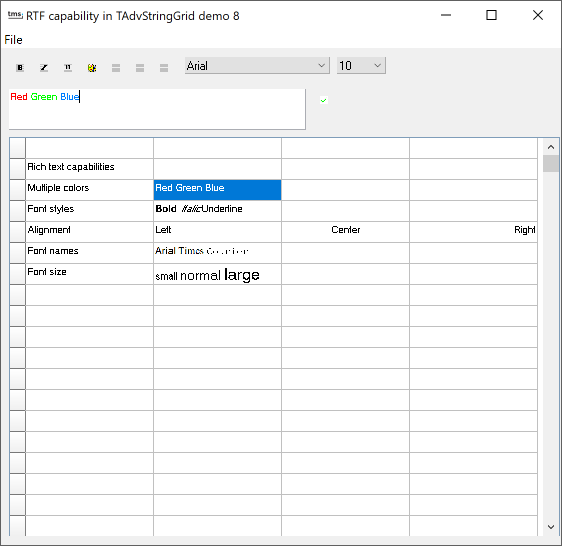 This method, transfers the text from cell [acol,arow] to the arichedit edit control. This is the inverse method that transfers the text back from the rich edit control to the grid at cell acol,arow. These two methods are used to connect the rich edit control to the grid. In the OnSelectCell event handler, text from the selected cell is transfered to the edit control, while the OnClick event handler of the update speedbutton transfers the current rich edit content back to the selected cell. Finally, full rich formatting can be saved as well to CSV files or being loaded from CSV files. Make sure though the MultiLineCells property is set true.